On behalf of The TeX Users Group and Duke University I would like to invite you to attend PracTeX 2005. 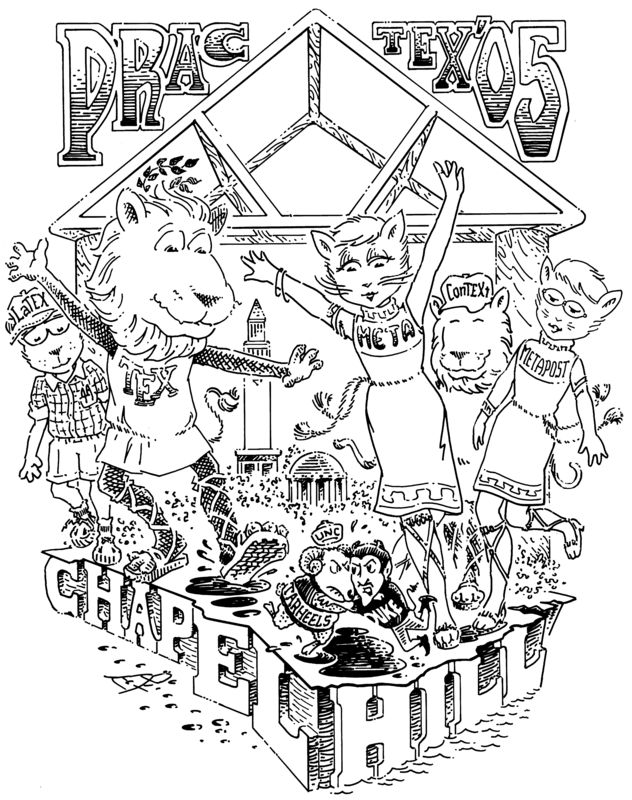 The conference will be held in Chapel Hill, NC, a congenial college town known to its inhabitants as the Southern Part of Heaven. Building on the success of PracTeX 2004 in San Francisco, this four-day conference focuses on practical techniques for document production using LaTeX, TeX, ConTeXt, MetaPost, and friends. It includes one day of classes and tutorials, followed by three days of presentations and workshops. PS Please feel free to print and post the conference flyer. This four-day conference focuses on practical techniques for document production using LaTeX, TeX, ConTeXt, MetaPost, and friends. It includes one day of classes and tutorials, followed by three days of presentations and workshops. Please submit a title and abstract for presentations or papers via email to conferences@tug.org with your proposed topic. More info on submissions. Preprints or slides received by May 15, 2005 (PDF preferred), will be included in the conference program. The final proceedings will be prepared as a TUGboat issue, after the conference. Workshops and other presentations without formal papers are also welcome, as mentioned above. Furthermore, we invite anyone to request topics of interest, and we'll do our best to find someone appropriate for the area. Conference attendees will enjoy an opening night reception and an (optional) banquet one evening. Coffee and lunch will be served each day of the meeting. Located in historic Chapel Hill, North Carolina. Conference fee and hotel information is available on the registration page. Mentioning the conference to colleagues and in any other contexts would be very much appreciated. We'd also be grateful for any posting of this one-page PDF flyer (TeX source). If you or your organization would like to help sponsor the conference, numerous options are available, from a straight cash donation (always welcome!) to logos on the conference memorabilia. Please see this separate sponsorship page for details, or email us. We are very grateful to Duke University for major support, as well as the many individual contributions. Sponsored by the TeX Users Group. This conference follows last year's Practical TeX conference in San Francisco.